ARZone Podcast 72 features a return visit with sociologist and activist Prof. David Nibert. 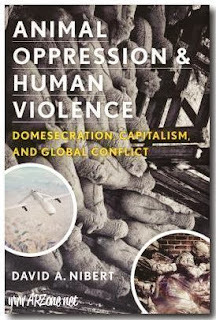 A professor of sociology at Wittenburg University in Springfield, Ohio, USA, David Nibert is the author of the recently published book "Animal Oppression and Human Violence: Domesecration, Capitalism and Global Conflict". David discusses the thesis of his book, that the "domesecration" of other animals both promoted and enabled human violence - and the destruction it has wrought. We speak with David about his new book, about the entanglements of all oppressions, about veganism, and about alternatives to exploitative capitalist-consumerism. Audio podcast, approx 62 mins. You may also listen H E R E, or visit this webpage to subscribe using iTunes, and please remember to visit ARZone on the web at www.ARZone.net. Professor Nibert is also the author of “Animal Rights/Human Rights: Entanglements of Oppression and Liberation”, published in 2002, in which he makes the connection between the exploitation of other animals, and the exploitation, mistreatment and violence against other devalued groups. In his work, David connects animal rights theory with other economic and sociological theories. He believes that speciesism is an ideology that seeks to legitimise animal slavery, perpetuating the oppression of other individuals based solely on their species.